Stephen Robinson Danielle Mastrion with her art. Stephen Robinson Fumero with his work-in-progress. 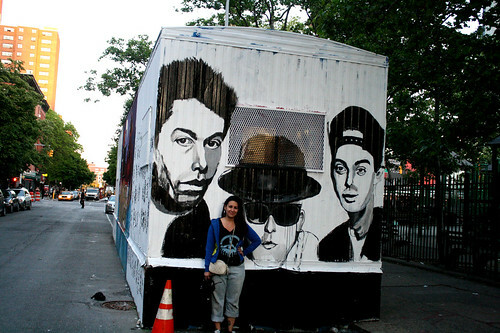 Less than a week after the death of Adam Yauch, a mural of him and his fellow Beastie Boys appeared on East First Street yesterday, part of “phase 3” of the Centre-fuge Public Art Project. The painting by Brooklyn native Danielle Mastrion joined new works by five other artists – Fumero, Michael DeNicola, Jade Fusco, CRAM Concepts and Bishop 203 – on a metal construction trailer between First and Second Avenues. Since the street-art initiative was launched in January, the modular unit has served as a canvas for a new batch of artists every other month. 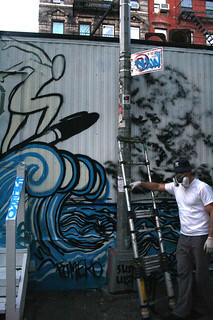 One of them, Fumero, recently painted a mural on the walls of The Strand. See another photo.